If God was kind enough to place me in such a beautiful area of the world, the least I can do is fly it’s flag proudly! 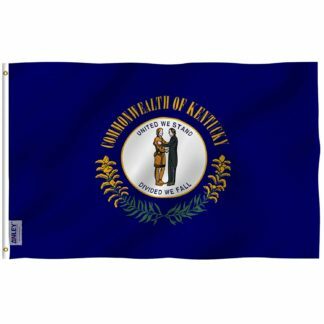 After using the 15-star flag of the Union, Kentucky accepted this design as the official state flag in 1918. The flag consists of the Commonwealth’s seal on a navy blue field, surrounded by the words “Commonwealth of Kentucky” above and sprigs of goldenrod, the state flower, below. The seal depicts a pioneer and a statesman embracing. Popular belief claims that the buckskin-clad man on the left is Daniel Boone, who was largely responsible for the exploration of Kentucky, and the man in the suit on the right is Henry Clay, Kentucky’s most famous statesman. However, the official explanation is that the men represent all frontiersmen and statesmen, rather than any specific persons. The state motto: “United We Stand, Divided We Fall” circles them. 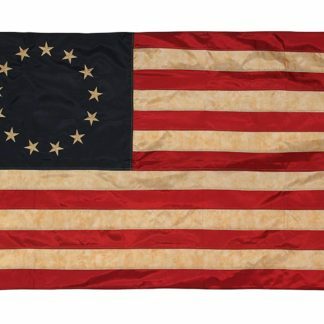 The motto comes from the lyrics of “The Liberty Song”, a patriotic song from the American Revolution.